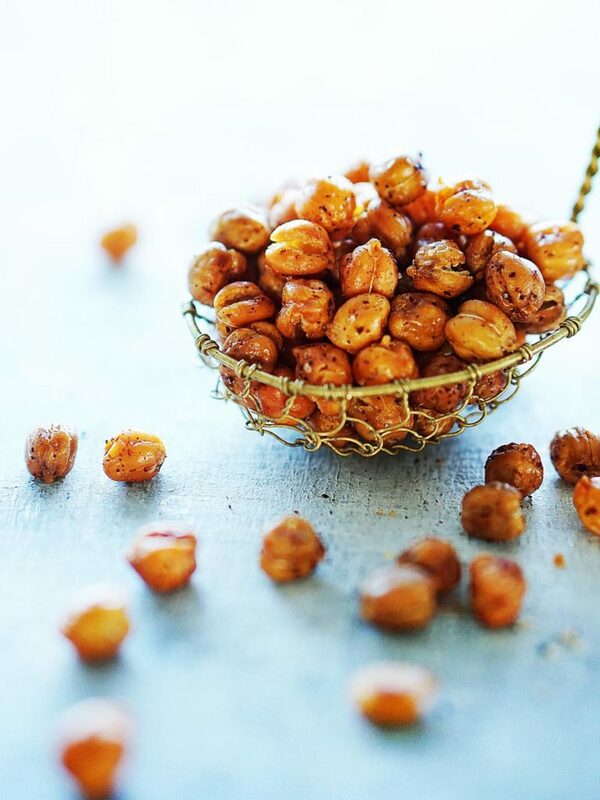 These crispy & spicy chickpeas (garbanzo beans) are oven roasted with only 4 ingredients making for a very healthy snack! I have a confession to make: I love having snacks around home for when I get the munchies. You know what I mean? Sometimes you’re not truly hungry but you just want to eat something. If it’s crunchy, even better! That’s when these Crispy & Spicy Chickpeas are perfect! Having healthy snacks at home is crucial so you’re not filling your body with junk. That way at least you’re eating something good for you. How are chickpeas good for you? Chickpeas are an excellent source of zinc, folate and protein! 100 grams of plain chickpeas contains 164 calories, 2.6 grams of fat (of which only 0.27 grams is saturated), 7.6 grams of dietary fiber and 8.9 grams of protein. Chickpeas also provide dietary phosphorus (49–53 mg/100 g), with some sources citing the garbanzo’s content as about the same as yogurt and close to milk. I am lactose intolerant so this is extremely important for me! Drain the can juices and rinse under cold water. Place the chickpeas on a baking pan making sure to do a single layer (I like to cover the baking pan with aluminum foil for easy clean up). Bake for 30 minutes first before you add the other ingredients. 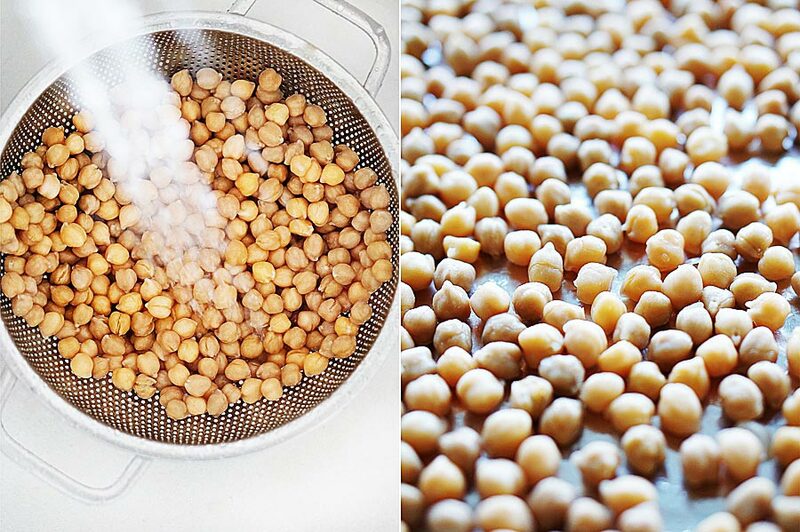 This is the key step that will make amazing crispy chickpeas. By doing this, you will ensure that the chickpeas get dry and the oil will adhere better and achieve the perfect crispy texture. Try this Cocido De Garbanzo (Spanish Chickpea Soup) for your next meal! It’s so delicious and easy to make as well. Place chickpeas on a baking sheet and bake for 30 minutes shaking the pan a few times throughout. Take out of oven and toss them with the oil, salt and chili. Bake for another 30 minutes shaking the tray a few times during this cooking time. hi ana, yr website looks fantastic – like a professional cookbook! Def trying this recipe – love chickpeas. What are you doing now re fitness? any more comps? do you still train hard? i miss your fitness blog with yr videos but i guess you cant blog it all !!!! I have always been a fan of chickpeas. These look scrumptious! They look very tasty… I guess you used already cooked chickpeas, don’t you? Now this is a great idea. I’m always looking for a healthier snack so I can avoid bad ones. Great blog. Yum, I just made curry baked chickpeas the other day as a topping for soup and it was absolutely divine! I love chickpeas! They make such a great snack, when cooked like this. Beautiful photography! 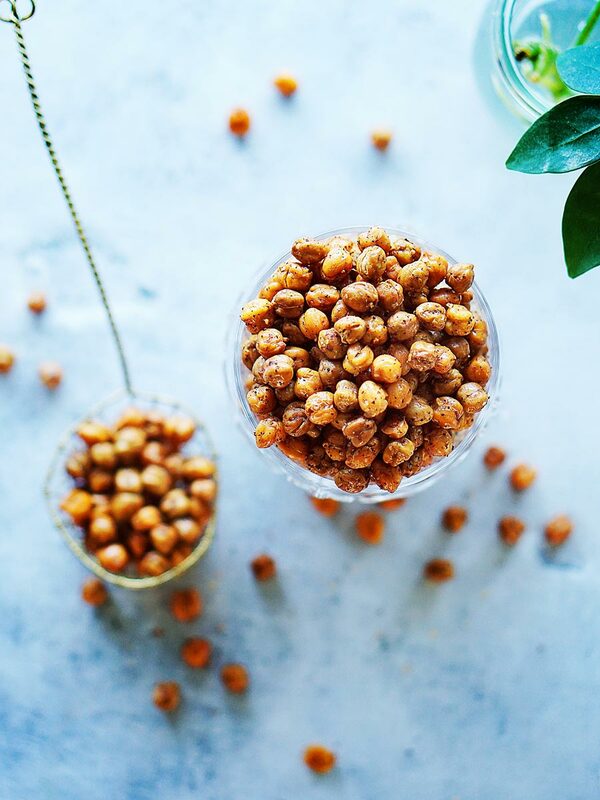 Chickpeas are so simple, but you made them look beautiful! @ Amanada – Hi girl! Thanks for the compliment! I’m still doing weight lifting like I used to. I don’t think I’ll ever change that. I’ve been wanting to do a post about updating where I’m at and you just confirmed I should do it! Stay in touch! @ Angie – Thanks! I love them too on soups and I may just add them to salads now. Thanks for stopping by! @Cris – Yes, they were already cooked from the can. I guess you can cook your own but it takes forever to soak them… I’m too lazy for that lol! @Chris! They’re definitely healthy. That’s why they speak to my heart 🙂 Thanks! @ Leanne – Oh curry on chickpeas sounds just delicious! I’ll add it to my list too. Great idea! Thanks! @ Julia – Awe thanks for your nice comment! I think they’re perfect for parties too. 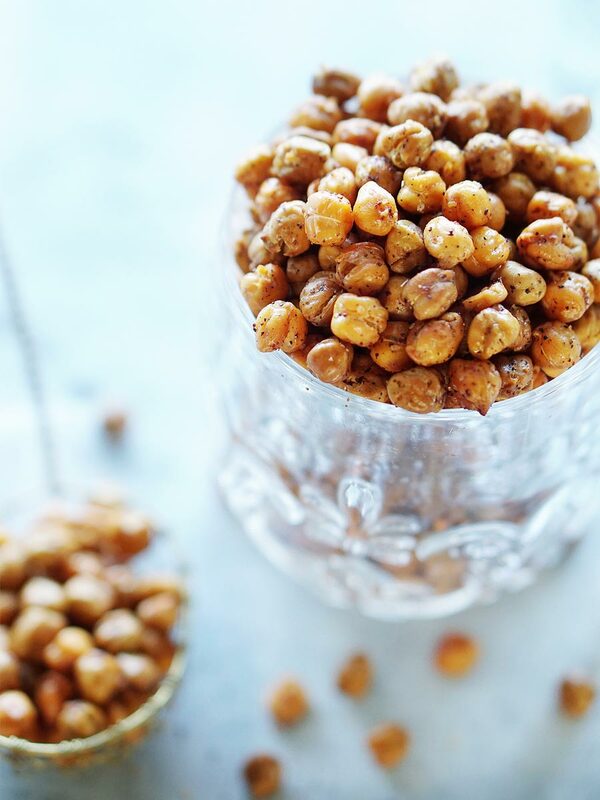 Spicy crispy chickpeas are delicious! I love the look of yours. Your pictures are beautiful as always. Can these be saved or do you need to eat them right away? Good question Emily. These are best if eaten within the first couple of days but they can keep fresh for up to a week in an airtight container in the fridge. Thanks! You’re very welcome Nicole! I’m glad you like them! Just made these today, delicious! Thanks for posting this recipe. I have wanted to try these. I have a question though. 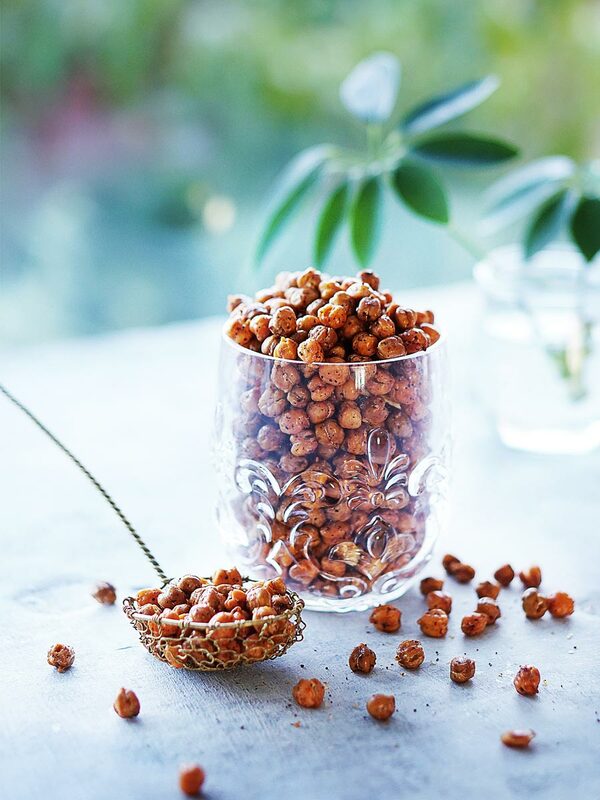 You stated above: Did you know that chickpeas are an excellent source of zinc, folate and protein? 100 grams of plain chickpeas contains 164 calories, 2.6 grams of fat (of which only 0.27 grams is saturated), 7.6 grams of dietary fiber and 8.9 grams of protein. 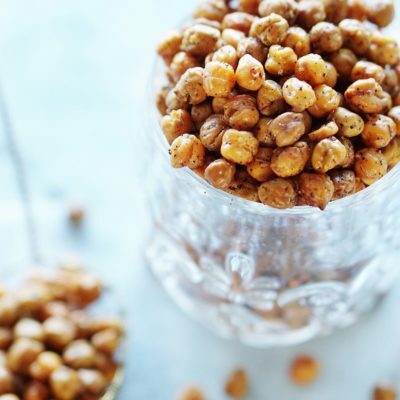 Chickpeas also provide dietary phosphorus (49–53 mg/100 g), with some sources citing the garbanzo’s content as about the same as yogurt and close to milk. How do measure 100 grams of plain chickpeas? Is this by volume or weight? I am trying to diligently watch my food intake and this is a snack I can see myself over-indulging in. Hi Sally, I use a kitchen scale to weigh my food when I want to be precise. I found mine at target for about $25. Not bad! Thanks! !